I recently discovered Audacity, a powerful freeware digital recording and editing program. It's encouraged me to start recording and putting online some MP3 recordings of some of my favorite "party pieces". This is a recording of the first verse of the famous Brahms lullaby ("Wiegenlied"), followed by "Hamalach Hagoel" sung to the same piano accompaniment. For the Hebrew part I thought of using the Yekkish pronunciation (as being closer in sound to the original German), but in the end used the Sephardi pronunciation with which I used to sing it to my own kids at bedtime. 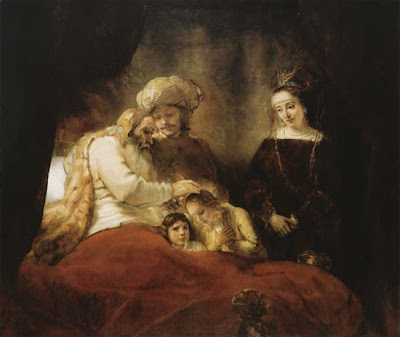 The Hebrew words are, of course, those of Jacob's blessing to his grandchildren Ephraim and Menashe, hence the associated picture, by Rembrandt, of the scene of that blessing.